Hey there! Remember when I was giving you all a tour of our home? A little ode to our Bungalow of Dreams? Yeah. Well. I went off on some adventures and then got super distracted and busy by trying to sell said home - STILL FOR SALE IF INTERESTED - but here I am again! Let's talk about our upstairs bathroom. When we moved in, it looked like this. Ummm. I know, right? Terrible. 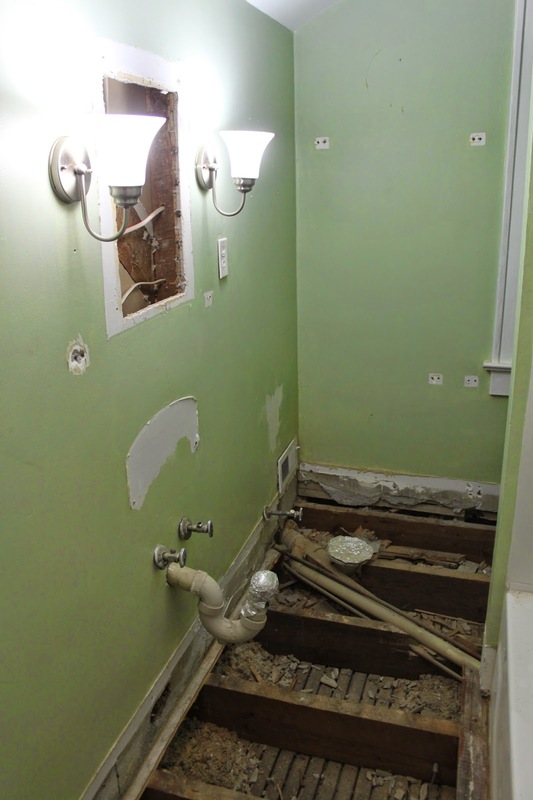 What is immediately obvious is that this bathroom was *not* original to the house. We aren't sure when it was added, but we do know that it.was.added. 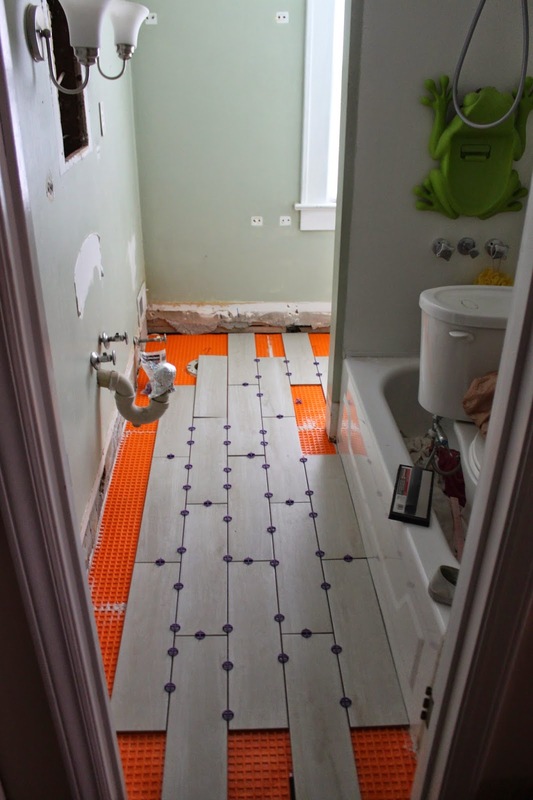 Fine by us, but the planning for the plumbing and all is totally not how we would have done it if we were planning this bathroom from scratch. Anyways. Those hollywood style dressing room lights? Bad. The random hanging cabinet around the corner? Bad. Plus - underneath of it, on the floor was a litter box. Which. I mean. Yeah, you gotta have when you have kitties. But, right where you would put your feet when sitting on the commode? No thanks. It is such a narrow space, we didn't know immediately what to do to make it better. But, we made some surface upgrades to at least make it look like grown ups lived there. 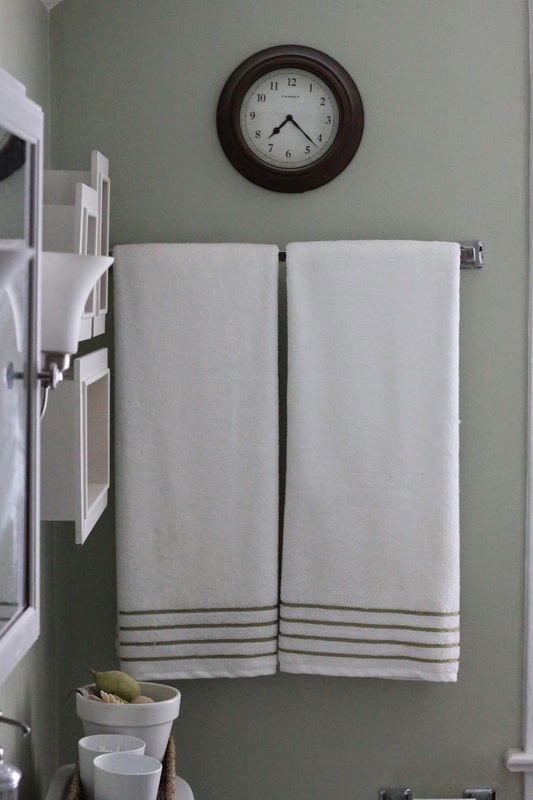 My husband always makes fun of me for wanting a clock in the bathroom, but he is definitely the one who also complains if I am running late! We painted the same green from our dining room and guest room downstairs (mainly because I had just enough left over to do the bathroom and I was so sick of picking out paint colors). 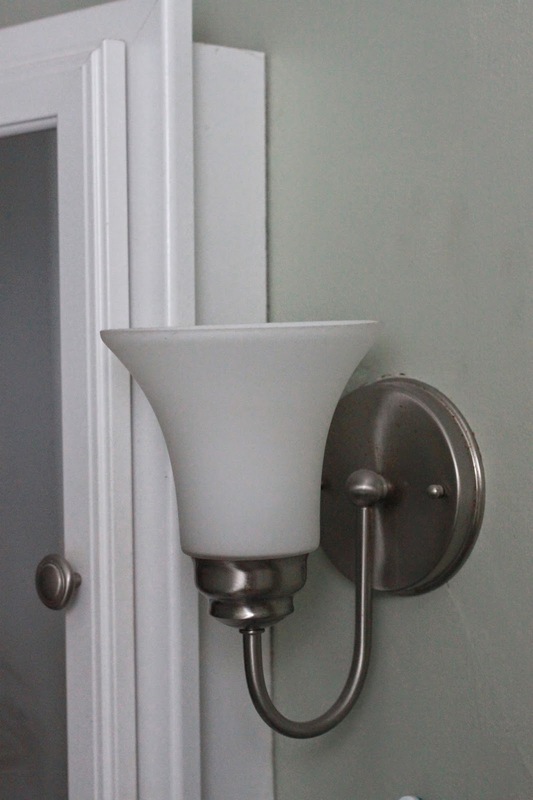 We changed out the lighting to these sconces (mainly because they were cute but cheap and came in a pair at Home Depot). 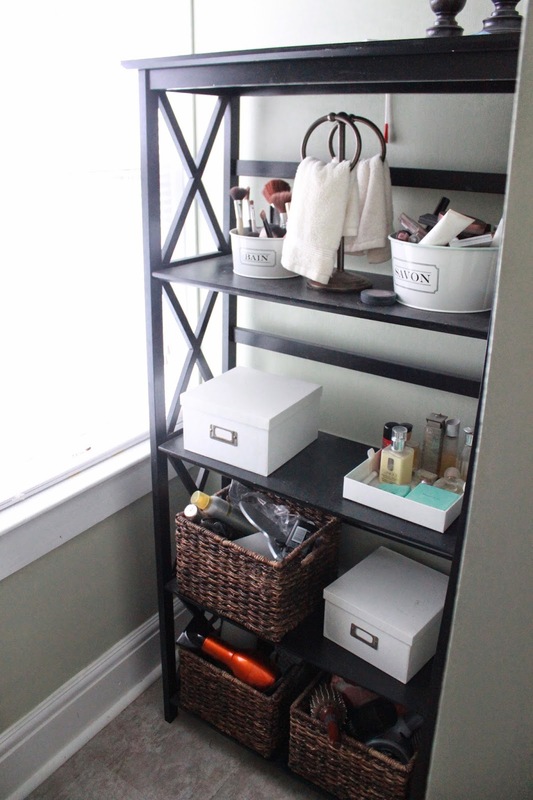 I grabbed a bookshelf from Garden Ridge on the cheap that would fit perfectly in the little nook between the end of the shower and the window and would give us some storage for the time being, and there it was. We lived with it this was for quite a while. 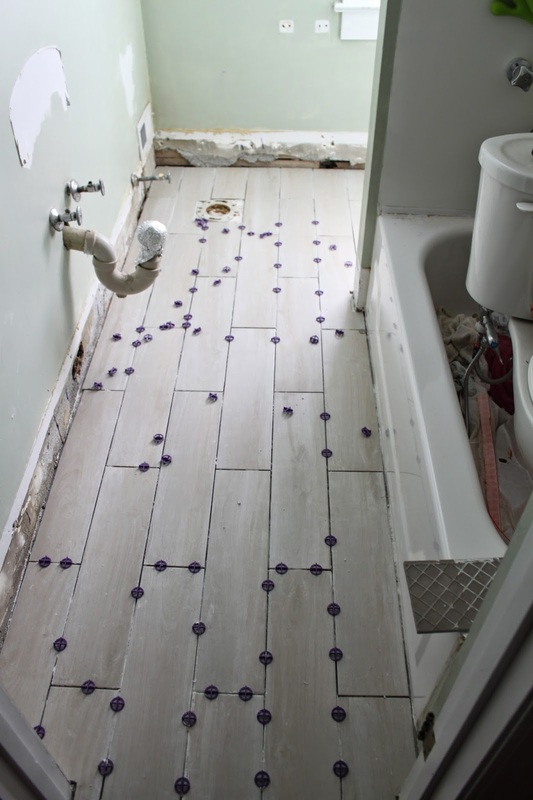 After a while, the issues with this bath just kept grating on us. It was fine, but it wasn't great. It certainly wasn't a "sanctuary." 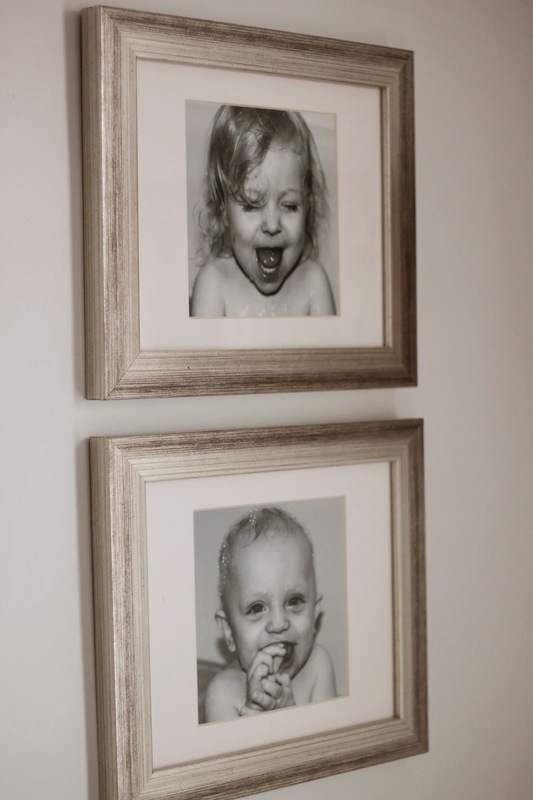 We went back and forth and teetered and tottered on what to do with this space. The mirror was tiny, everything was tiny! It is such a narrow space we felt really limited as to what sort of sink we could put in and still be able to function in the bathroom. We wanted more storage, and storage that wasn't so open, and counter space! There was none. 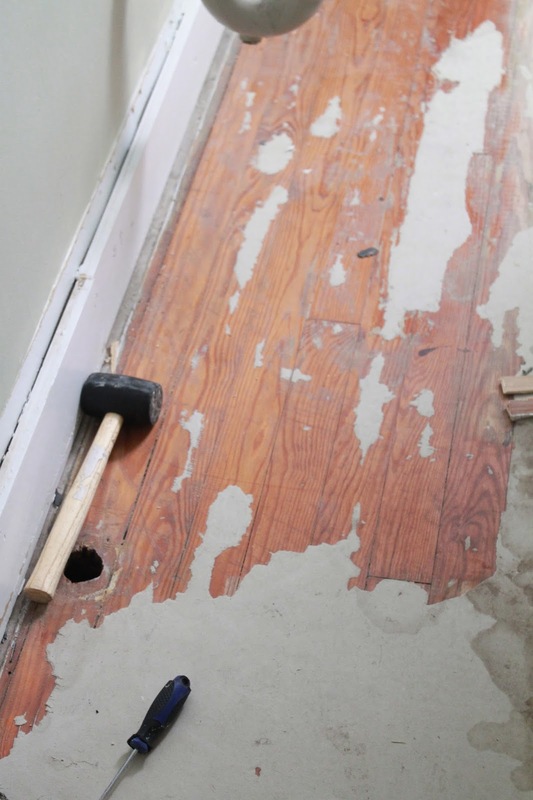 Plus the floors were these terrible peel and stick vinyl tiles that had not been stuck all that well. Literally the only counter space in the bathroom. 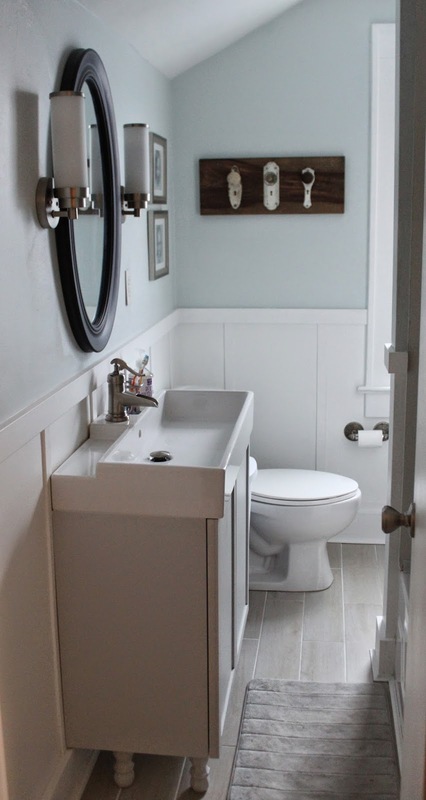 We knew that while we would love to move the entire bathroom around to function and use the space better (stay tuned for the "What I would do if I won the lottery" post!) 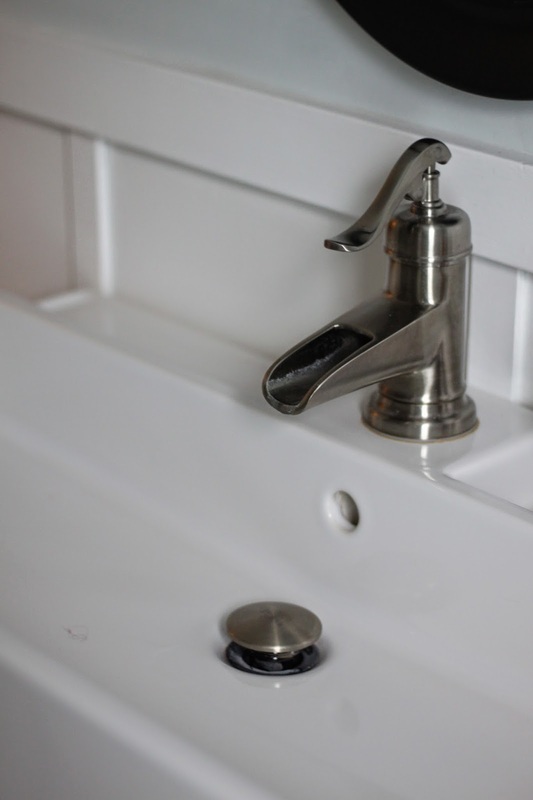 - we didn't want to put the cash into moving plumbing when we knew we wouldn't be here much longer. Finally, we found a sink. At IKEA! Now, this was before our kitchen renovation, so we hadn't already fallen in love with the genius that is IKEA. We were nervous. BUT. It only came 16 inches from the wall, and was 31 inches long! That was astounding to us, and such a better use of our super narrow space. Things got worse, before they got better. Much, much worse. This is about the point where we looked at each other at midnight with no floor and said, "What the hell have we gotten ourselves into?!?" …and then, it got much, MUCH better. Ah, so much better than looking at your home's own infrastructure, yes? 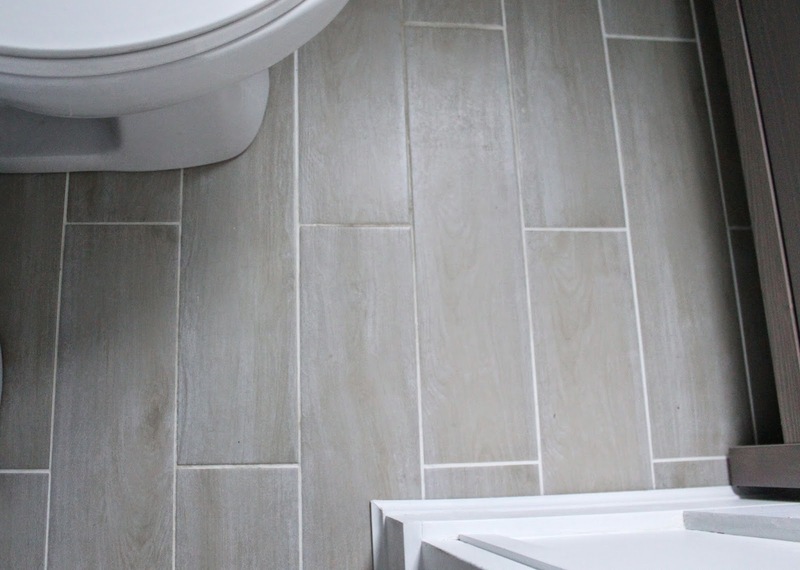 We decided to add a tile that had a slight wood grain look that we fell in absolute love with - it picked up on the gray and blue tones that we wanted to bring into the space and still managed to bring a warmth as well. No regrets there. 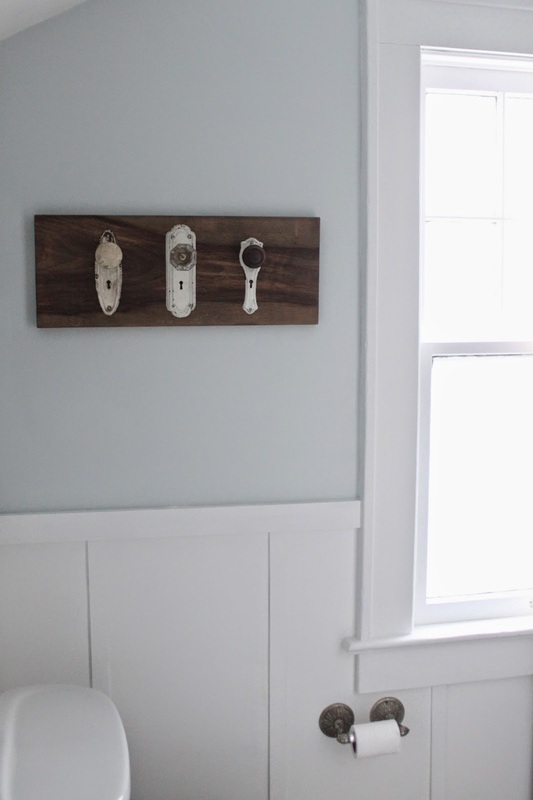 We added a board and batten treatment to the walls to help brighten the space and give it some of the same level of interest and character as the rest of our home. We brought in new and polished elements, but old ones as well. We also put a treatment on the glass of the window to give it a "haze" which allows in all the natural light, but keeps the privacy as well. Goodbye mini blinds! 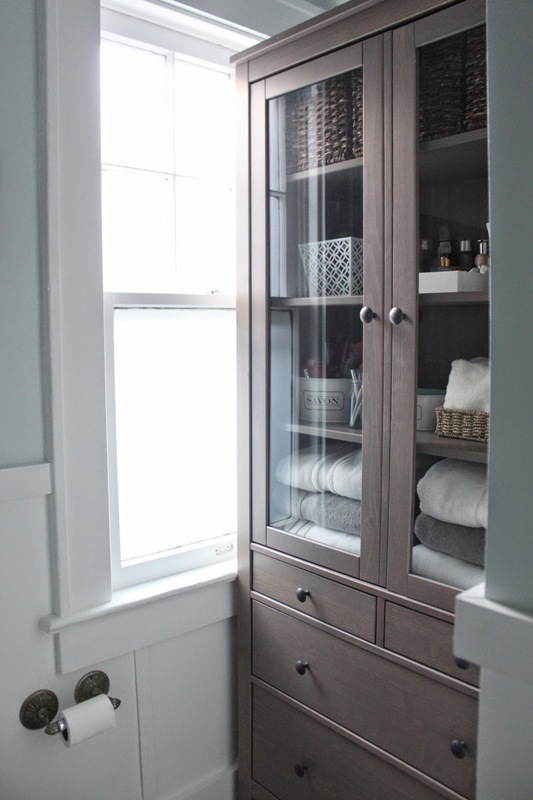 I did a bunch of modifications to the cabinet that came with the sink - white laminate was not the look we were going for, and I really, really didn't feel like building my own - and it ended up amazing. As you can see in the mirror (much bigger and nicer than the previous one!) we added a giant hutch that fits perfectly in the space and added so much storage that I honestly can't fill it. …and I have a LOT of bathroom stuff. 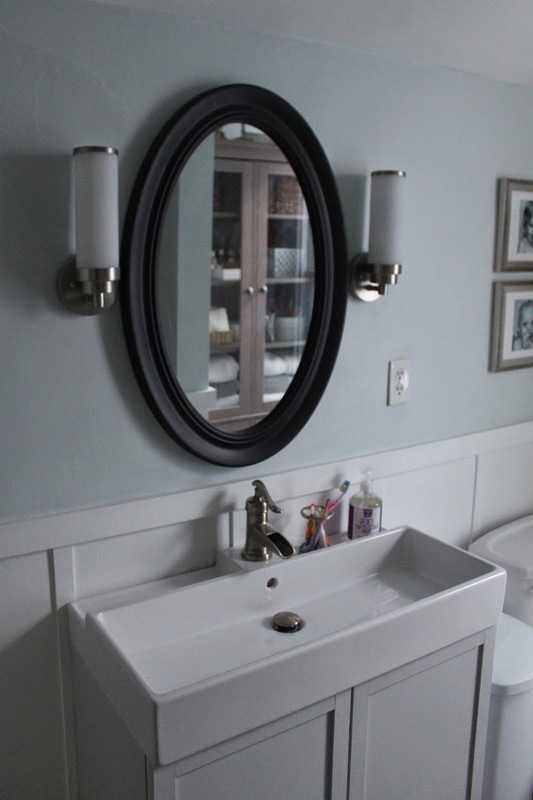 We changed out the mirror and the sconces to better take advantage of the space that we did have, but everything is much more flush to the wall. These sconces project an entire inch less than the previous ones, and draw the eye upward. Same with the mirror which is twice as tall as the previous one, but doesn't project out as part of a medicine cabinet - we recouped that storage, and then some, in other places. I found this toilet paper roll holder at a local antique shop and I am absolutely obsessed with it. As I said before, we really didn't change the layout of this room, but we did recoup some of the breathing room with very intentional choices, and really improved the storage and function. Let's take a look at how far we've come. 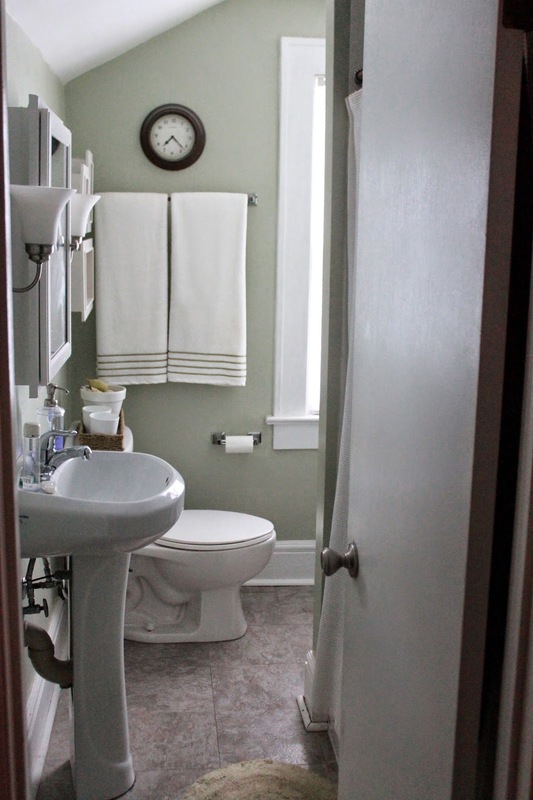 …and is it weird if the bathroom is now one of my favorite rooms in our home?